Some observers have blamed colonialism for conflicts between wildlife and local people, since a lot of elephants was shot, and vast land developed for farming during late 18 and early 19 century, while others believe the human-elephant conflict is as old as agriculture itself in Africa. Today, the conflicts occur mainly due to human overpopulation in subagricultural areas. Some elephants, especially bulls, are crop-raiding fields, mostly in night time. In one night they can destroy an annual harvest for the farmers, which in most cases is a personal tragedy for the whole family. The classical method to prevent crop raiding is to guard the fields, shoot the elephants and use electrical fencing, but its not alwys working, and when there is human elephant interaction, thers always victims, may it be the elephants or the humans. According to the United Nations Human Development Report for 2003, almost 42 percent of Malawi's population lives below the poverty line of a dollar a day. 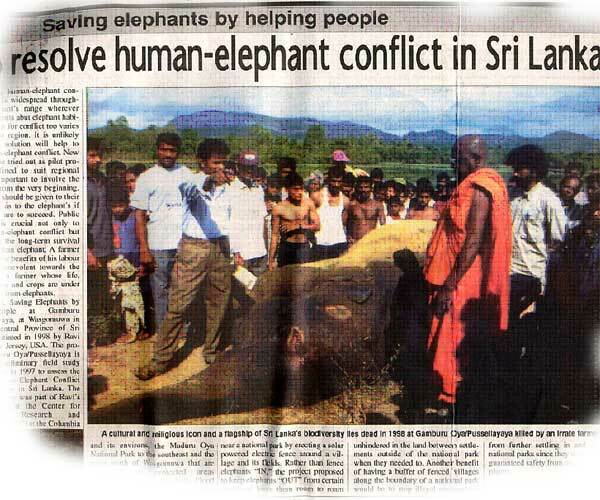 1997, Sri Lanka: human-elephant conflict claimed the lives of 40 villagers, while an estimated 130 elephants were killed outside their jungle habitat. Elephants hate the smell of chili, especially when the stems have been burnt. It appears they...distance themselves from where the chili is growing,� he added. U.S. Fish and Wildlife Service, International Affairs 2002 grants for the elephant human conflicts in asia.